Abstract: Solanum L. section Petota Dumort., which includes the cultivated potato (S. tuberosum L.) and its wild relatives, is distributed from the southwestern United States to central Argentina, Uruguay, and adjacent Chile. Section Etuberosum (Buk. & Kameraz) A. Child, a closely related group, is distributed in Argentina and Chile. This taxonomic treatment includes all wild species of these two sections from southern South America to include all areas of the countries of Argentina, Bolivia, Brazil, Chile, Paraguay, and Uruguay. Section Etuberosum is entirely diploid (2n = 24), whereas sect. Petota includes diploids (2n = 24), triploids (2n = 36), tetraploids (2n = 48), and hexaploids (2n = 72). We here recognize three species from sect. Etuberosum and 27 species from sect. Petota from this region, and divide the latter into six informal species groups. Relative to the most recent comprehensive treatment of these species by Hawkes in 1990, we place in synonymy names of 36 species, seven subspecies, and one variety, and raise one subspecies to species rank; our treatment, therefore, recognizes only 40% of the taxa from Hawkes’s 1990 treatment. 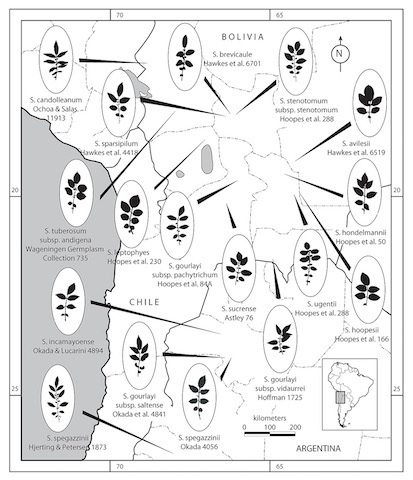 We identified major range expansions for S. acaule Bitter and S. medians Bitter in Chile, and S. morelliforme Bitter & Münch in Bolivia. We present a summary of recent morphological and molecular studies of species limits and species interrelationships, and provide descriptions, synonymies (including designations of lectotypes), illustrations, locality data, and distribution maps for all species.